The Village of Cridersville was founded in 1856. With the discovery of oil in 1885 the village prospered and grew quickly. Its business district developed along Main Street in the first block east of the railroad. The Town Pond Reservoir was constructed here in the 1890s to provide water in the event of fire. 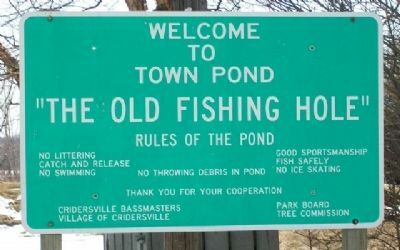 At 3:00 p.m. on May 2, 1918, a rubbish fire was started across the street from this pond and blew out of control. The fire ignited a nearby barn, and, with the aid of strong winds, soon carried to the business district on East Main Street. Wood frame construction and wooden shingles allowed the fire to spread rapidly. 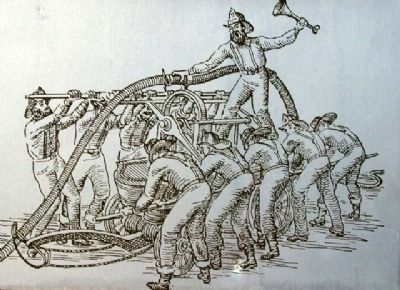 Within an hour both sides of Main Street were ablaze and the village had but a single hand pumper to fight the fire. The Lima and Wapakoneta Fire Companies were notified at once. Upon arrival, they began to pump from this pond and within an hour it was dry. Boy Scouts and soldiers from Lima also came to help fight the fire. The column of smoke could be seen for miles and the heat was so intense that trains could not pass through town. By 6:00 p.m.
Cridersville's downtown was gone. Only the cast iron safe of the Home Bank remained among the embers. In all, 32 structures were destroyed and 50 people rendered homeless. Fortunately, no one was seriously injured in the fire. Before the development of municipal water systems, modern fire fighting equipment, and fireproof building materials, disastrous fires like this were all too common in communities of every size in America. Location. 40° 39.191′ N, 84° 8.646′ W. Marker is in Cridersville, Ohio, in Auglaize County. Marker is at the intersection of Main Street and the CSX railroad tracks, on the left when traveling west on Main Street. Touch for map. Marker is at or near this postal address: 100 E. Main Street, Lima OH 45806, United States of America. Touch for directions. Johnny Appleseed Tree (approx. 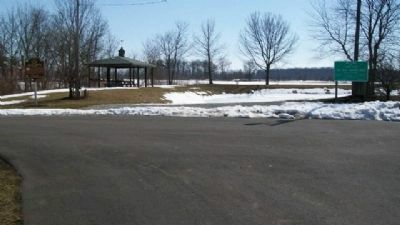 3 miles away); a different marker also named Shawnee Council House (approx. 3.3 miles away); In Memory of Chief P-H-T and the Hawg Creek Shawnee (approx. 3.4 miles away); Veterans Freedom Flag Monument (approx. 3.9 miles away); Solar Refinery (approx. 5 miles away). 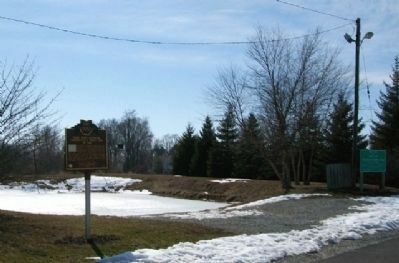 Looking SW, with Town Pond behind marker. More. 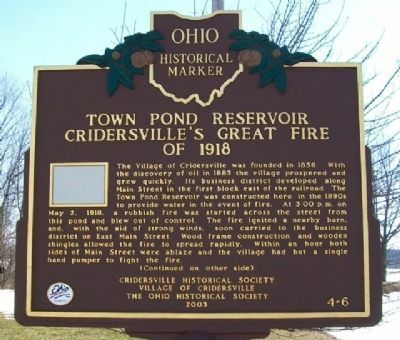 Search the internet for Town Pond Reservoir Cridersville's Great Fire of 1918. Credits. This page was last revised on June 16, 2016. This page originally submitted on March 15, 2010, by William Fischer, Jr. of Scranton, Pennsylvania. This page has been viewed 1,061 times since then and 8 times this year. Photos: 1, 2, 3, 4, 5, 6. submitted on March 15, 2010, by William Fischer, Jr. of Scranton, Pennsylvania.